The Architect's Mind | Arts and Culture | Style Weekly - Richmond, VA local news, arts, and events. 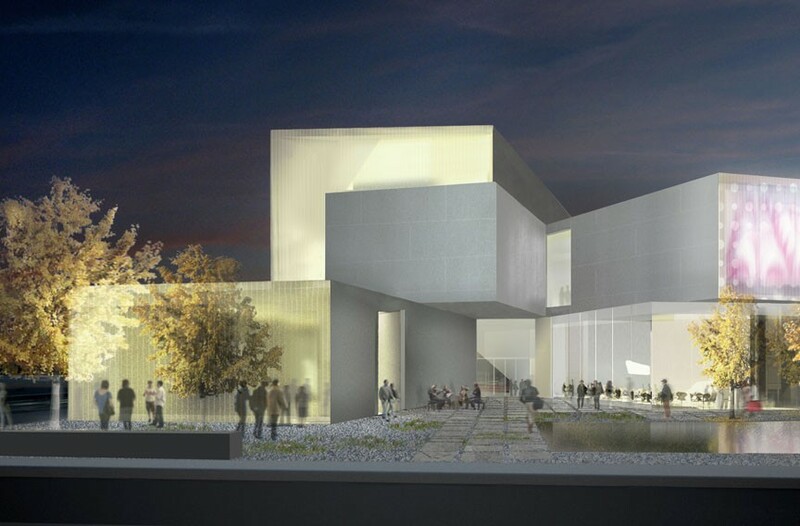 A rendering depicts the Institute for Contemporary Art's exterior and garden. Some years ago Mies van der Rohe and Philip Johnson, two of the 20th century's titan architects, were joined at lunch by Paul Goldberger, a noted critic and writer. As is often the case when designers gather over food and drink, it wasn't long before pens and pencils emerged and architectural ideas were being sketched on cocktail napkins. Goldberger later wrote that as the trio left the dining room, he turned back to retrieve the famous architects' impromptu but potent sketches. Too late: A busboy had scrunched them up and was tossing them in the trash. That episode came to mind recently when I visited "Steven Holl Architects: Forking Time," a modest but rewarding and revelatory exhibition at the Virginia Center for Architecture. The bulk of the show consists of 36 small, conceptual, graphite and watercolor sketches, plus 30 impressionistic study models for the Institute of Contemporary Art, a facility proposed for the School of the Arts at Virginia Commonwealth University. Scheduled to open in 2015, the institute is ambitious for the rigor of its envisioned programs and its bold architectural concept. The 38,000-square-foot building will provide exhibition, performance and classroom spaces in what's envisioned as a landmark building designed for multidisciplinary interaction and maximum flexibility. Like drawings rendered on napkins that channel spontaneous thought processes, Holl's three-dozen graphite drawings, which are animated by subtly applied shades of watercolor, reveal the gestation period last year as the architect mulled broad architectural concepts for the ICA. What he came up with is site-inspired and high-concept. The proposed spot for the building is at the southwest corner of West Broad and Belvidere streets. This is the city's busiest crossroads, where 32 traffic lanes converge. This motorist's nightmare of an intersection also is a major entry point for the university's sprawling Monroe Park campus. Holl doesn't flinch, but embraces this cacophony as opportunity. He places a large, abstractly sculptural, double-story atrium at the entrance on the corner of Belvidere and Broad. Thus, we determine by examining Holl's sketches, just like a beacon across the water or landing lights at an airport, the institute will be a welcoming architectural icon for motorists moving either south on Belvidere or west on Broad. We also see that the lobby space inside should offer a welcoming, light-drenched and orienting experience. Other big ideas emerge from the sketches and models. Just as certain city streets — Franklin Street, Park Avenue, Floyd Avenue and Main Street — extend fanlike westward from Monroe Park, the public spaces of Holl's building — the galleries, auditorium and café — will be contained in rectangular extensions that will extend "fork-like" as a grand gesture reflecting the local street grid. If these early renderings, which have been removed from Holl's sketchbooks and hung on the wall in chronological order, reveal Holl's thought process, the series of models suggest that his colleagues at Steven Holl Architects in New York take it from there. The study models of wood, cardboard and mat board appear to have been crafted by various pairs of hands. After examining the sketches and models, you arrive at a more finished and larger-scale model of the two-story building. Unfortunately, this model doesn't inform as well as it could, because it doesn't show the important sculpture garden slated for just west of the new building and will be an integral part of the overall program and design. 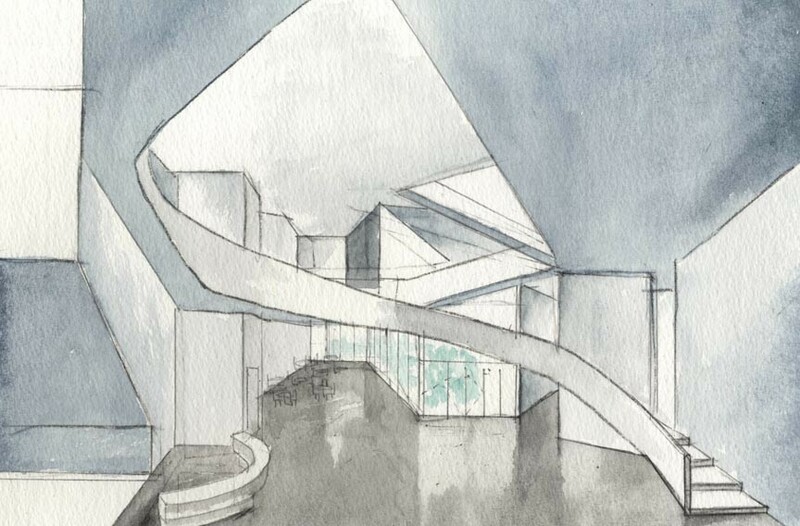 This watercolor and graphite drawing by Steven Holl shows the Institute for Contemporary Art's bright entry space. Toward the end of the exhibition Steven Holl Architects offers a thorough introduction to the project with a computer-generated "fly-through." We're moved along Broad and Belvidere streets. We're zoomed from the exterior of the building to the dramatically lighted interiors. We can feel the architectural and spatial energy. 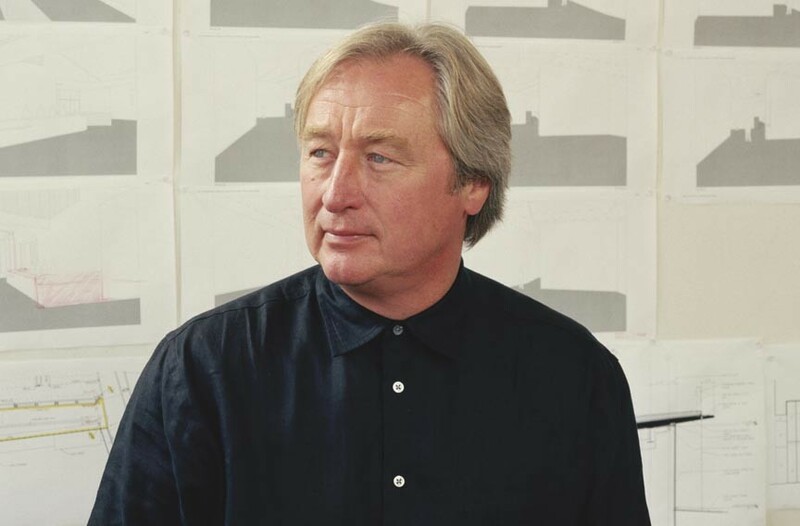 "Steven Holl Architects: Forking Time" runs through Oct. 18 at the Virginia Center for Architecture, 2501 Monument Ave. For information, call 644-3041 or visit virginiaarchitecture.org. Holl will lecture on his work on Monday, Oct. 15, at 6 p.m. at VCU's Singleton Center. Free.